So, what’s the big deal about Narrative? … and why is it important for social media? Sure, you need to tell a good story in a blog post, but social media is fast, it’s short, and it’s visual … so why does narrative matter? Humans understand the world through stories. When we see a picture, a statistic, or even a Tweet, we interpret it in light of the stories we believe to be true about the world — the traditional myths and religious stories of our culture, and also the modern myths we are exposed to through the educational system and the media. If what we see conflicts directly with those stories, we experience a mental conflict. This conflict is called cognitive dissonance, and if it is too great, we will often dismiss even things which are (to a different observer) objectively true. There are, of course, many elements of story, but I think one of the most important elements of story is the drama triangle — the relationship between the hero, the villain and the victim of the story. And who is the hero in their story? In the state of mild cognitive dissonance that I suspect this image created for many people, perhaps they come to see themselves as a hero, as someone who has recognized injustice and reacted with outrage (even if they haven’t done anything). This is important. Giving your viewer a way to imagine themselves as the hero of the story is a powerful way to bring them into your movement, cause or organization. At Webskillet, one of the things we think is really important to realize is that whatever you do, people will see it in the context of narrative and story. Which means if you’re not making conscious decisions about who you are casting in those roles, other people will fill them in — and not always in ways that work to your advantage. Who is the villain? Pretty obviously, the rich guy on the right. And the guy on the left is obviously a victim. But who is the hero? To me, it seems like the hero of this image is all the (off-screen) liberals, who are smarter than this idiot. Which, if you think about it, is a pretty insulting and condescending message. Consider a working-class couple in my home state of Kansas. He has just been laid off, she works for minimum wage as a home-care worker, and their kid is taking on enormous debt to attend Fort Hayes State University. 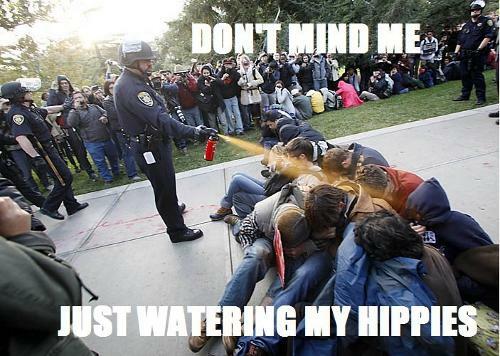 What do they see in the pepper-spray cop picture? This is too bad, because this couple have a lot in common with many people in our movement. If we are going to build a society based on justice, we need unemployed workers, home care workers, and students at state universities in rural areas to be part of our movement. This is not to say that it was wrong for the movement to spread the pepper-spray cop image as far and as wide as possible; only that we need to be attentive to the different ways that people understand (or mis-understand) our messages — and understanding narrative is an important tool for doing that. We need to figure out the stories that can challenge people’s assumptions, — and our social media needs to be part of that. Much of our thinking about narrative and story is based on the work of smartMeme. They are awesome. Visit their website, and give them money!